CHICAGO (AP) — Lori Lightfoot’s victory in the Chicago mayor’s race signaled hope among voters that the nation’s third-largest city may someday move beyond long-entrenched divides, racial and otherwise, that have left large parts of the metropolis feeling ignored by people in power. 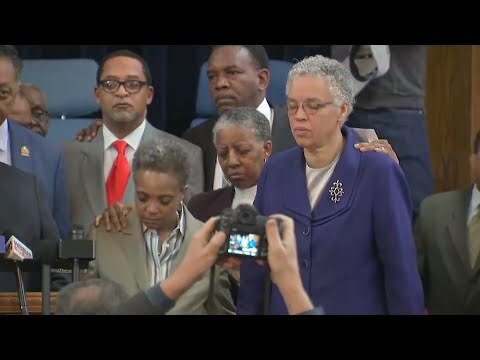 “Today is April 3, a new day for all of Chicago,” Lightfoot said Wednesday at a news conference called by the Rev. Jesse Jackson to promote postelection unity . Preckwinkle stood beside her. Chicago has long struggled with issues of segregation, housing discrimination mostly targeting blacks and Hispanics and a generationally engrained mistrust of the city’s mostly white police department. The tension between police and residents exploded in protests following the 2014 fatal shooting of 17-year-old Laquan McDonald by a white police office. Jason Van Dyke was sentenced earlier this year to fewer than seven years in prison for second-degree murder. Joyce Ross, 64, supported Lightfoot and said one of the reasons she’s most excited about her taking office stems from her own unsuccessful efforts to get a city job decades ago. She recalled it as a time when who she knew seemed more important than what she knew. Finley Campbell, a spokesman for the Chicago-based Unitarian Universalist Multiracial Racial Unity Action Council, said part of what makes Lightfoot’s win historic is also that she reached out successfully to white voters. Lightfoot said she took Tuesday’s results as a mandate for change, and that she plans to “take full advantage of it.” But she noted there is much difficult work ahead .